Anyone can say they have the best chocolate chip cookies recipe, but this really is the best EVER! REALLY! These are salted, brown buttered, triple chocolate, Nutella stuffed cookies that will absolutely make your mouth drool for more after one bite. They have a crispy edge and a gooey center. They are my new favorite cookie. 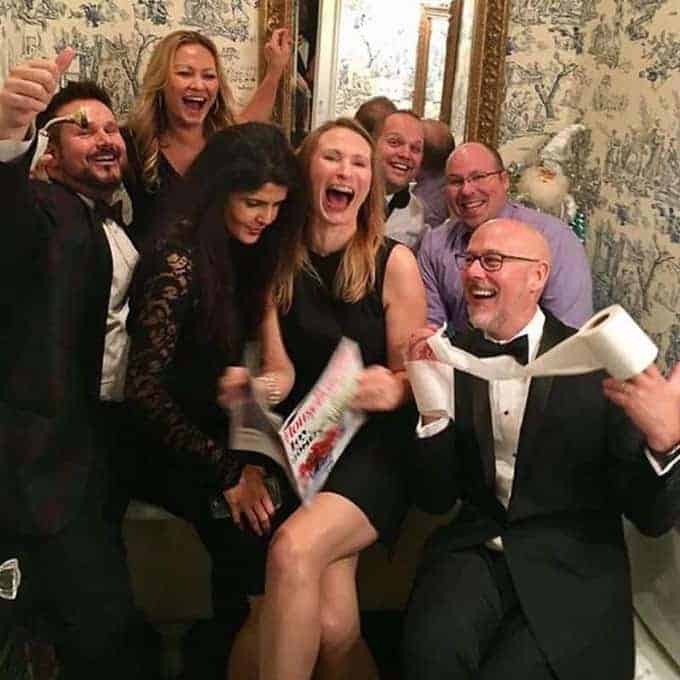 So I turned 40 recently… What? 40? How did that happen? I’ll tell you what. I dreaded turning 30, but turning 40 really wasn’t a big deal. If fact, I no longer hide my age and I own it. When I was in my early 20s, I was a train wreck. I was insecure and unsure of myself. I hated my nose, my hair, my crooked smile, my body… Quite frankly, I hated looking in the mirror. And worst of all, I thought I wasn’t very smart… These insecurities turned into fear. The fear prevented me from doing a lot of things. When I met my husband, he was everything I wanted to be. He was incredibly smart, confident, and successful. He knew what he wanted in life and he went for it. I was just in awe. I thought when I married him, he would complete me just like Rennee Zellwegger thought Tom Cruise would in Jerry Maguire. If he thought I was pretty, then I was pretty. If he thought I was smart, then I was smart. If he loved me, then I was loved. This way of thinking turned me into a needy, clingy person. I relied on his approval for me to find approval in myself. Then one day he sat me down and gave me the greatest gift anyone could give me. He looked me in the eyes and said, “Look, I love you, but I don’t complete you. I can’t make you happy. You have to make yourself happy. I can only add to your happiness. And you have to love yourself for that to happen.” It was like a light bulb in my head went off. I knew he was right. Slowly, I started to learn to love myself. Slowly, I started coming out of my box and believing in myself. Slowly I became a head strong, independent woman that isn’t afraid to speak her mind and go for what she wants. I almost feel sorry for my husband because he married a mousy, shy, sweet girl. Now he can’t shut me up. If I have an opinion, then by golly you are going to hear it! 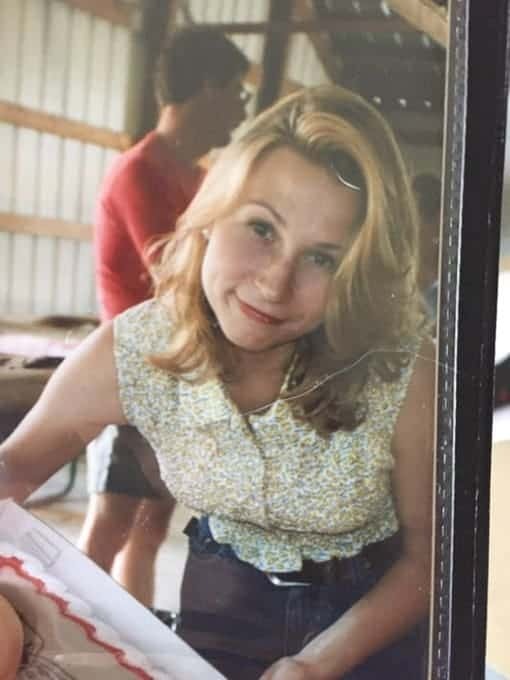 This past summer, I came across this picture of me in my 20s from my Grandmother’s photo albums. I was just shocked. I don’t remember myself this way. I was beautiful. What was I thinking? How could I hate myself so much? Oh… If I could just tell my 20 year old self what I know now, I could have conquered the world. And so this is me today, front and center with the magazine. The story behind this picture is for another day, but I love this picture because I am whole heartedly laughing and genuinely happy. I am who I am, and I really don’t care what anyone besides God Himself thinks of me. It is a very liberating feeling. I love myself for who I am and I embrace the added wrinkles it took to get there. I write all of this in a post because creating this blog was a step out of my box. I was terrified I would fail and the whole world would see it. I was scared to be publicly vulnerable. But slowly, I have been letting little pieces of me come out in my posts. As I have grown with you; my readers, I have wanted to connect more with you. I want to tell all of you women that if you don’t love yourself, no-one else can. That what we see in the mirror is only a half truth. Our real beauty is from within. And when you grasp that concept, you shine for the whole world to see your whole beauty. And so I am putting myself out there: This is who I am… you can love me or hate me… but I damn sure do have some good recipes!!!! Now on to the best chocolate chip cookies recipe, for after all that is really what you have come for; not all this nonsense about me. 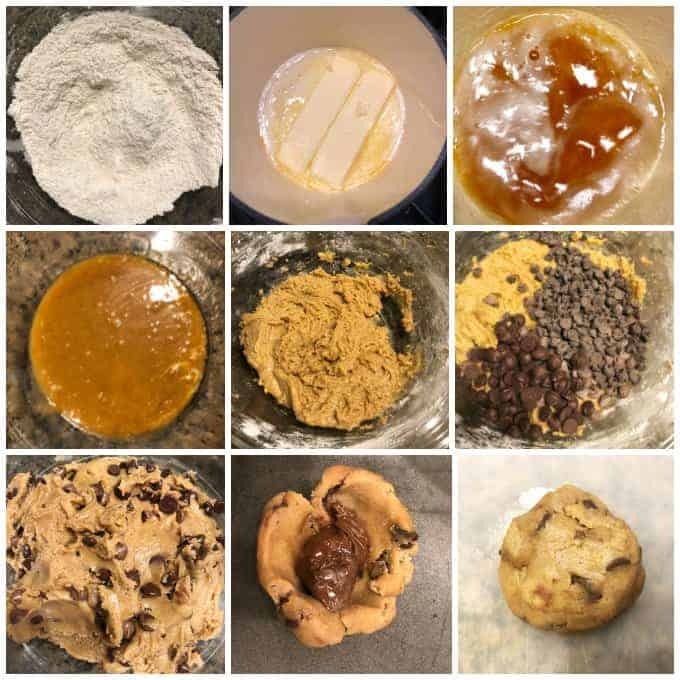 My sister-in-law, Melanie, said she found the best chocolate chip cookie recipe ever created from Ambitious Kitchen. Honestly, when she told me this, I was politely smiling at her but thinking to myself, “All chocolate chip cookies are good. None of them really stand out though.” I was WRONG!! These little guys are made with brown butter…(That alone could make them a winner. If you tried my Banana Bread Bars with Brown Butter Frosting, you would know why!) two types of sugar, dark chocolate chips, milk chocolate chips, semi-sweet chocolate chips, and NUTELLA! They are AMAZING! What seals the deal is the coarse sea salt at the end. Once baked, you have INCREDIBLY WICKED GOOD cookies. You have a combination of a soft gooey center with a crunchy edge and a salty finish. 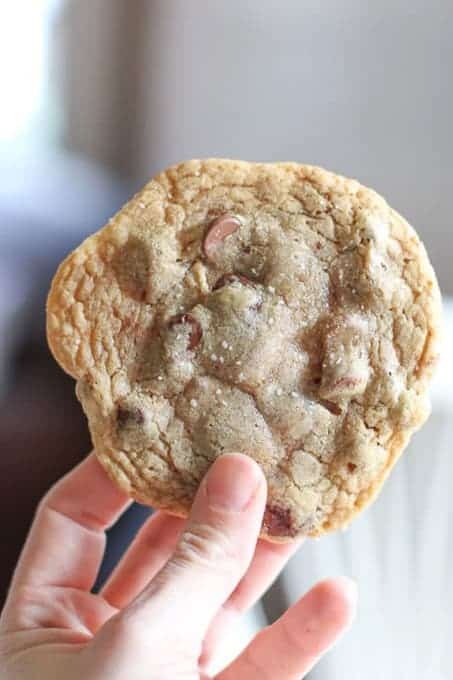 Therefore, for my 40th, my sister-in-law made this best chocolate chip cookies recipe for me. I don’t know if she is the most wonderful sister-in-law in the world for making these or the most evil, because I now crave these cookies ALL THE TIME! Did she find the best chocolate chip cookies recipe in the whole wide world ever? These cookies take a little more work than a typical chocolate cookie, but the effort is worth it. With an electric mixer, mix the butter and sugars until blended. Beat in the egg, egg yolk, vanilla, and yogurt until combined. Slowly add dry ingredients and beat on low-speed just until combined. Gently fold in all of the chocolate chips. Chill dough for 2 or more hours. Roll 1 1/2 tablespoons of dough into a ball. Flatten the dough ball very thinly into the palm of your hand. Place 1 teaspoon of chilled Nutella in the center. Fold dough around it, rolling into a ball — it doesn’t have to be perfect. However, make sure Nutella is not seeping out of dough. Add more dough if necessary. 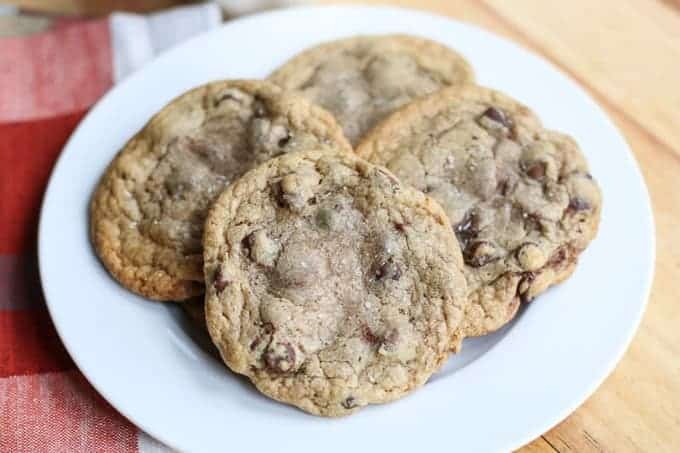 Bake into the BEST Chocolate Chip Cookies you will ever eat! Sweet B’Geeze they are TASTY! If you want to make someone fall in love with you, just make them a batch of these. Anyone can say they have the best chocolate chip cookies recipe, but this really is the best EVER! REALLY! 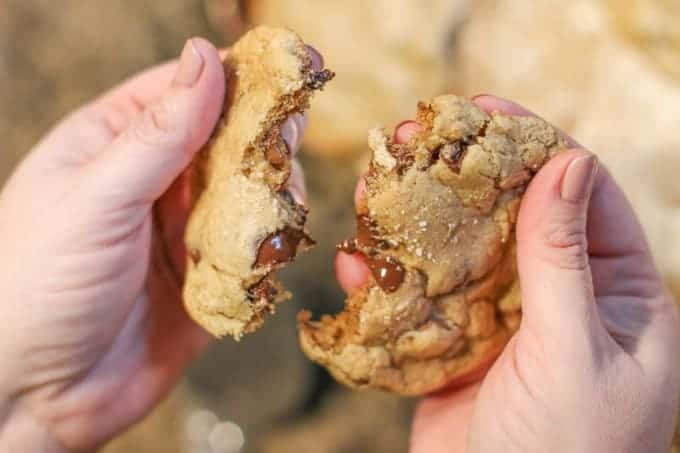 These are salted, brown buttered, triple chocolate, Nutella stuffed cookies that will absolutely make your mouth drool for more after one bite. They have a crispy edge and a gooey center. Melt butter in a saucepan over medium heat. Watch carefully and stir the butter to prevent it from scorching. Once the butter turns a toasty brown color, remove from heat immediately. Set aside to cool for a few minutes. With an electric mixer, mix the butter and sugars until blended. Beat in the egg, egg yolk, vanilla, and yogurt until combined. Slowly add dry ingredients and beat on low-speed just until combined. Gently fold in all of the chocolate chips. Roll 1 1/2 tablespoons of dough into a ball. Flatten the dough ball very thinly into the palm of your hand. Place 1 teaspoon of chilled Nutella in the center. Fold dough around it, rolling into a ball -- it doesn’t have to be perfect. However, make sure Nutella is not seeping out of dough. Add more dough if necessary. Place dough balls on cookie sheet, 2 inches apart and flatten tops with your hand VERY gently. Bake the cookies 9-11 minutes or until the edges of the cookies begin to turn golden brown. They will look underdone in the middle, but will continue to cook once out of the oven. Cool cookies on the sheets at least 2 minutes. Sprinkle with a little sea salt. Remove the cooled cookies from the baking sheets after a few minutes and transfer to a wire rack to cool completely. Repeat with remaining dough. I’m def more confident in my 40’s than I was in my 20’s. So unsure of myself I was then. But I AM sure that these cookies look amazing!!! Pinning! Awe… thank you Janet. xoxo Love you friend. I’m certain that I will try this cookie recipe; however, the story you’ve shared here is of great value to me! Thank you Katie for being such a great friend and giving back so often to others. You are awesome! ❤️ And, yes you do have great recipes.